European leaders appear to have agreed that Greece can cut its VAT rate in a move designed to win support for more public spending cuts as the embattled nation prepares for a crunch decision on a second international bailout. Athens was offered the VAT olive branch in a last-ditch effort to win over conservative opposition, which has been demanding tax cuts as the price for agreeing to further EU loans. It believes tax cuts will encourage businesses to expand and help the economy grow. After several days of wrangling, a German source said the so-called troika team of EU, IMF and European central bank inspectors had struck a deal with the socialist government on VAT cuts as part of a wider agreement that Athens will reduce its debts to below 3% of GDP by 2014. "They have agreed on it," the source said. A deal is expected in the next few days, before an EU finance ministers meeting at the end of June. However, political agreement remained elusive after the opposition Democracy party warned that it wanted more than a VAT cut. A party official said: "If correct, it is a good step, but not good enough; it is not sufficient to restart the economy." 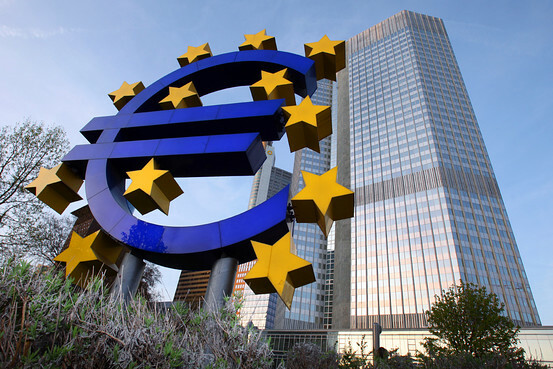 The eurozone was supposed to be an updated version of the classical gold standard. Countries in external deficit receive private financing from abroad. If such financing dries up, economic activity shrinks. Unemployment then drives down wages and prices, causing an “internal devaluation”. In the long run, this should deliver financeable balances in the external payments and fiscal accounts, though only after many years of pain. In the eurozone, however, much of this borrowing flows via banks. When the crisis comes, liquidity-starved banking sectors start to collapse. Credit-constrained governments can do little, or nothing, to prevent that from happening. This, then, is a gold standard on financial sector steroids. The role of banks is central. Almost all of the money in a contemporary economy consists of the liabilities of financial institutions. In the eurozone, for example, currency in circulation is just 9 per cent of broad money (M3). If this is a true currency union, a deposit in any eurozone bank must be the equivalent of a deposit in any other bank. But what happens if the banks in a given country are on the verge of collapse? The answer is that this presumption of equal value no longer holds. 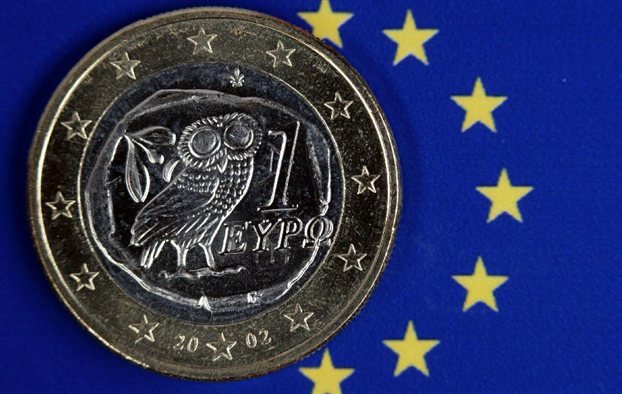 A euro in a Greek bank is today no longer the same as a euro in a German bank. In this situation, there is not only the risk of a run on a bank but also the risk of a run on a national banking system. This is, of course, what the federal government has prevented in the US. European stock markets closed sharply higher on hopes that Greece will be able to avoid a restructuring of its debt. Greek banks surged, while oil stocks like Total gained as the euro rose and the dollar fell. Shares of mobile-phone giant Nokia, which warned investors that it might not book a profit in its core business this quarter, sank nearly 18%. The stock was one of the biggest decliners on the Stoxx Europe 600 index. The Stoxx 600 closed up 0.8% to 281.06. Germany may abandon a push to reschedule Greek debt early, which would allow for fresh aid for Greece. The euro rallied on the news, helping oil to rise. The Greece ASE Composite index soared 5.6%. Shares of Eurobank Ergasias and National Bank of Greece were up around 11%, while Alpha Bank was up 8.6%. "Greece and its ability to find yet another accommodation with its many creditors will continue to set the tone for Europe," said Stephen Pope, managing partner of Spotlight Ideas. "Naturally any suggestion that obligations will be honored, even if later as against sooner, will deliver a benefit for the affected parties, namely the euro and exposed banks." Greece is in the midst of a classic default spiral, one of the great paradoxes of the financial markets. In its simplest form, a debt spiral begins when an issuer, be it a corporation, municipality, or country faces an upcoming obligation which it needs to refinance. If the markets deem that issuer to be a poor credit risk, that issuer’s cost of selling new debt to pay off its upcoming obligation rises, increasing expenses and further impairing credit quality. If this cycle raises financing costs to unsustainable levels, say 24 – 25%, it becomes wholly impossible for the issuer to pay off upcoming obligations by issuing new ones, hence ensuring a default and earning the name debt or default spiral. 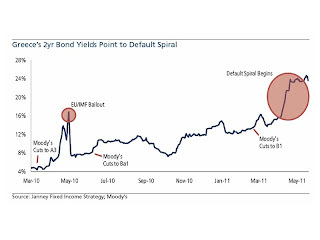 As a default spiral is a self-sustaining game, the only way for an issuer to solve a default spiral is by breaking the rules of the game, namely via obtaining external assistance (being acquired, or, in our example, obtaining low cost loans from other governments) or by defaulting. The only way that the first option, obtaining support, can work is if that support somehow restores confidence in the spiraling issuer. Valentijn Van Nieuwenhuijzen, head of strategy and chief economist at ING Investment Management, talks about the prospect of further loans for Greece from the European Union, European Central Bank and the International Monetary Fund. He speaks with Linzie Janis on Bloomberg Television's "Countdown." Greece appears to have agreed a tax cut with its international lenders, aimed at forging a broad consensus for more austerity to avoid a debt default, but the opposition said on Tuesday this would still not win its support. 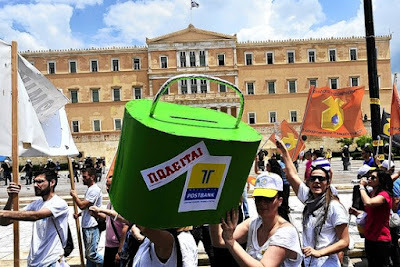 International lenders are demanding that leading Greek political parties sign up to the government's latest austerity and reform drive to ensure that Greece keeps tackling its huge budget deficit for years to come, whoever is in power. In Berlin, a German coalition source said European Union, IMF and ECB inspectors had struck a deal with the Socialist government on a value-added tax cut. "They have agreed on it," the source said, following Athens newspaper reports that the "troika" team, which is scrutinizing Greek finances, had backed a reduction in VAT rates. Who will blink first on the next steps to rescue Greece – the mighty European Central Bank, jealously guarding its independence, or the powerful German political establishment, pledged to defend the taxpayer’s interest, and fearing a backlash from vengeful voters if it fails? At the core of their disagreement stands the question of whether private creditors must somehow – at least voluntarily – be involved in any deal to ease the terms of Greece’s debt burden, and buy more time to turn that economy round. Across the party spectrum in Berlin there is a remarkable degree of agreement that bondholders must share the burden with the taxpayer in any new programme. It is not just Wolfgang Schäuble, the finance minister, who says so, but all the leading party finance spokesmen in the German Bundestag. At the ECB headquarters in Frankfurt, however, any such deal is seen as unwise and unworkable. Several executive board members have declared that if Greece’s sovereign bonds are rescheduled in any way, they will no longer be usable as collateral for pumping liquidity into the Greek banking system. That would spell disaster for the Greek economy. Inspectors from the EU, the International Monetary Fund and the European Central Bank are set to wrap up a review of Greece’s progress in meeting the terms of last year’s 110 billion-euro ($158 billion) bailout in the next few days. The EU will then formulate its plan for further aid to Greece, which remains shut out of financial markets a year after the rescue. Under the terms of the rescue package, Greece was due to return to financial markets and sell about 30 billion euros of bonds next year. With its 10-year bonds yielding 16.4 percent, more than twice that of the time of the bailout, the EU has indicated Greece will need more aid to plug its financing gap. The IMF has threatened to withhold its share of the payments until the EU explains how Greece will be funded. If, as expected, it turns out that Greece isn’t meeting the program’s conditions, euro-region countries must see what steps Greece can undertake to get back on track in addition to what it’s doing already, a German Finance Ministry spokesman said today, speaking on customary condition of anonymity. The cost of borrowing for Greece and other peripheral economies fell amid increasing hopes that European policymakers are drafting a second bail-out package for Athens. Germany has also helped boost sentiment by appearing to back away from demands that Athens restructure its debt, which the European Central Bank has warned could lead to contagion. Jean-Claude Juncker, who heads the eurogroup of finance ministers, said on Monday that European leaders would decide on a new aid package by the end of June and ruled out a “total restructuring” of Greek debt. His comments shored up the euro as well as the eurozone peripheral bond markets of Greece, Ireland and Portugal and, to a lesser degree, Italy and Spain. David Watts, a European credit strategist at Creditsights Inc., talks about the outlook for a Greek debt restructuring and its impact on European banks. He speaks with Maryam Nemazee on Bloomberg Television's "The Pulse." Ο οίκος αξιολόγησης Fitch Ratings δήλωσε σήμερα πως αμφιβάλλει για την ικανότητα των ελληνικών αρχών να εφαρμόσουν πλήρως το απαραίτητο πρόγραμμα για να αποκατασταθεί η δημοσιονομική αξιοπιστία της χώρας. Σε ανακοίνωσή του, ο οίκος επισημαίνει επίσης το εύρος των προκλήσεων που πρέπει να αντιμετωπίσει η Αθήνα. Οι ανησυχίες αυτές εξηγούν την απόφαση του Fitch να μειώσει στα τέλη Μαΐου σε «Β+» την αξιολόγηση του ελληνικού χρέους. 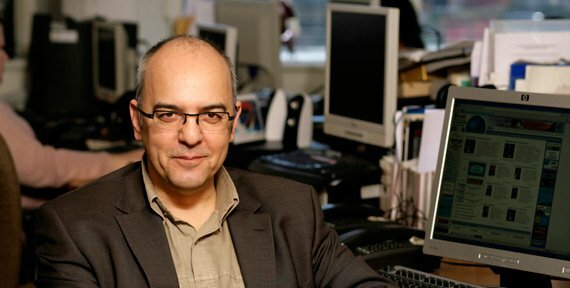 Ο Fitch εξηγεί πως η αξιολόγηση αυτή, όσο χαμηλή κι αν είναι, λαμβάνει υπόψη την καταβολή νέων αρωγών από την ΕΕ και το ΔΝΤ. Δεν είναι συμβατή με μια «ήπια» αναδιάρθρωση ή «αναδιάταξη» του ελληνικού χρέους, η οποία θα υποχρέωνε τον Fitch να θεωρήσει ότι η χώρα βρίσκεται σε αδυναμία αποπληρωμής του χρέους της, προειδοποιεί ο οίκος αξιολόγησης. Spanish style protests: Up to now, Greeks were occasionally going for a protest against austerity measures. In too many cases, it turned violent and ended quite quickly. 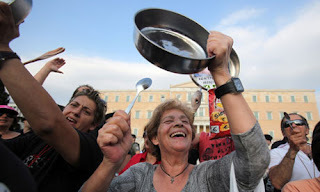 Things are different now: inspired by the Spaniards, the Greeks have changed the style: since Sunday, May 22nd, they protest peacefully in front of the parliament building at Syntagma Square in Athens. They blame the government and the banks for corruption, and keep up the pressure. This is much more efficient. A general strike is planned for Saturday, June 4th. Talkin’ ’bout a revolution: German paper Bild reports (German) reports that some of the protesters are talking about a revolution: they don’t have hope in the current ruling party nor the opposition nor the European Union. 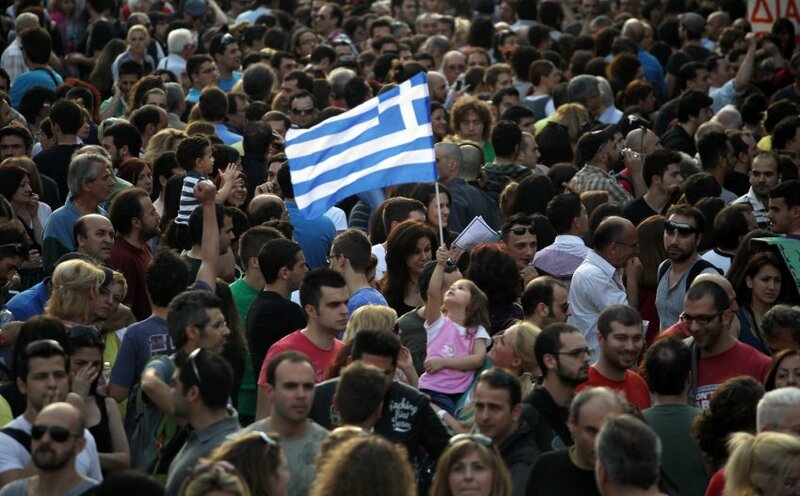 A third of Greeks already support a revolution. Getting Ready for Default: Some aren’t just protesting but acting to protect themselves from a default: Greek banks hold a lot of government bonds. 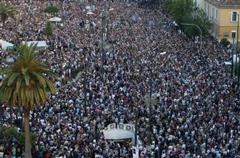 Greek citizens fear that the banks will freeze and begin getting cash: 1.5 billion euros were withdrawn in just two days. This accelerated with the protests. 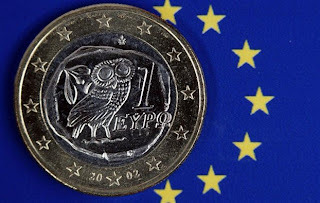 The euro climbed to a three-week high against the dollar on Tuesday as fears receded over an imminent restructuring of Greek government debt. The single currency advanced as reports suggested Germany might have relented in its efforts to push through a rescheduling of Athens’ debt in the short term. This raised optimism that the EU and International Monetary Fund could announce a new loan for Greece, possibly at a meeting of finance ministers on June 20. Germany has been engaged in a dispute with the European Central Bank over Greek government debt, with the ECB warning that any re-profiling for Greece could cause a systemic financial crisis throughout the eurozone. As European policymakers inch their painful way towards another stopgap bail-out for Greece, a high-level debate is taking place on the nature of the country’s plight. In one corner is Otmar Issing, the respected former chief economist of the European Central Bank, who roundly declares that Greece is insolvent and will never pay its debts. In the other sits Lorenzo Bini Smaghi, a board member of the ECB, who told the Financial Times that the country’s balance sheet was far from being a wreck. With Greece’s debt potentially heading towards 180 per cent of gross domestic product, Mr Bini Smaghi’s position might seem Panglossian in the extreme. But before dismissing the case out of hand, it is worth taking a careful look at the arguments advanced by those who are adamantly opposed to debt restructuring. Jacob Kirkegaard, research fellow at the Peterson Institute for International Economics, Charlie Gushee, managing director of Auerbach Grayson & Company, and Michael Woolfolk, managing director at Bank of New York Mellon, talk about Greece's sovereign debt crisis and the possibility of additional aid from the European Union. They speak with Pimm Fox on Bloomberg Television's "Taking Stock." Markets got a boost early Tuesday following news of a potential Greek sovereign-debt bailout solution. Dow Jones Newswires' Paul Vigna and Stephen Wisnefski discuss on the Markets Hub. Stocks rose worldwide, paring the biggest monthly decline since August, and the euro gained amid speculation nations will pledge more aid to Greece. Commodities advanced, while Treasuries erased losses after U.S. economic reports missed forecasts. The MSCI All-Country World Index increased 1 percent at 10:41 a.m. in New York, paring this month’s loss to 2.8 percent. The euro climbed to a three-week high of $1.4424, and the yen fell against its 16 major peers. Among 10-year bonds, German bunds added five basis points to 3.02 percent, Greek yields slid 23 basis points to 15.93 percent and Treasuries dropped to 3.06 percent from 3.10 percent. Oil rose, and wheat dropped. European Union leaders will decide on a new aid package for Greece by the end of next month, Luxembourg’s Jean-Claude Juncker, who leads the group of euro-area finance ministers, said yesterday in Paris. More than $1.8 trillion was erased from the value of stocks worldwide this month through yesterday as evidence mounted that the U.S. economic recovery is slowing and EU officials struggled to contain the region’s debt crisis. 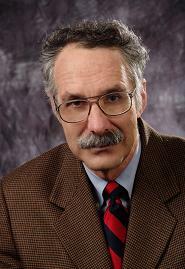 David Blanchflower, a professor at Dartmouth College and Bloomberg Television contributing editor, talks about Greece's debt crisis and the European banking system. Blanchflower, a former policy maker at the Bank of England, speaks on Bloomberg Television's "InBusiness with Margaret Brennan." Η σοβούσα κρίση έδειξε ότι το ώς τώρα ισχύον σύστημα επιδοτήσεων ήταν μια πολυτέλεια, η οποία δεν είναι δυνατόν να συνεχίσει να υφίσταται. Μόλις την περασμένη εβδομάδα, ηθοποιοί και σκηνοθέτες μαζεύτηκαν στην αυλή του Υπουργείου Πολιτισμού και διαμαρτυρήθηκαν, επειδή το υπουργείο ακόμη δεν τους έχει καταβάλει εγκεκριμένες επιχορηγήσεις των τελευταίων δυο - τριών ετών. Η διαμαρτυρία τους ήταν απολύτως δικαιολογημένη και είναι υποχρέωση του κράτους να τηρήσει την υπόσχεσή του απέναντι σε αυτούς τους ανθρώπους. Για τον εξορθολογισμό της λειτουργίας του, όμως, είναι και υποχρέωσή του να παύσει το καθεστώς των επιχορηγήσεων, που ούτε είναι αντικειμενικό ούτε λειτουργεί με διαφάνεια. Greek bond spreads against German bunds tightened sharply Tuesday after a report in the Wall Street Journal said that Germany is considering dropping its push for a rescheduling of Greek debt in order to facilitate a new package of aid loans. "We are seeing the periphery tighten as risk sentiment improves on the back of the WSJ article but trading volumes are not huge for the time being," said a London trader. The Greek/German 10-year yield spread—the amount of extra interest investors demand for holding Greek bonds compared to triple-A rated German bunds-—tightened by 0.32 percentage points to 13 percentage points. In the two-year maturity, the Greek/German spread contracted by 0.36 percentage points to 22.84 percentage points, while in the five-year sector the spread has tightened in by 0.44 percentage points to trade at 18.06 percentage points. Jan Lambregts, head of financial market research at Rabobank International, talks about the Greek debt crisis and the prospects for another international bailout. He speaks with Mark Barton on Bloomberg Television's "On The Move." Manolis Kandaris' wife was in labor and he wanted to get her to a hospital, fast. So he reached for the car keys, fetched the video camera and dashed out to get his clunky Citroen running. As he sprinted to the car, muggers attacked him about a block from his apartment. And when he resisted their attempts to wrench the camera from him, the 44-year-old pharmaceuticals executive was stabbed to death. His wife found him lying in a pool of blood as she hobbled to the car with the help of her mother. She was taken to a maternity ward; he was taken to the morgue. Long prided as one of Europe's safest capitals, this ancient metropolis is cowering in the shadow of harrowing crimes and lawless rampages. Within 24 hours of the Kandaris killing, a 21-year-old man from Bangladesh was stabbed to death in what police suspect was a revenge killing. The following day, mobs of ultranationalist youths bolted through the center of Athens, battering scores of illegal immigrants. Three days later, masked youths enraged by a police beating firebombed a precinct in downtown Athens, critically injuring two men and a 55-year-old female flower seller. "It never used to be this way," said Ioannis Makris, president of the Athens police union. "We're seeing a lot of rage as a result of the financial crisis, a lot of desperate people resorting to fistfights, not to mention gunfire and stabbings, for trite causes." Dirk Faltin, a senior economist at UBS AG, talks about Greece's debt crisis and bond yields. He speaks from Zurich with Francine Lacqua on Bloomberg Television's "The Pulse." Οι φόροι δεν μοιάζουν με τον θάνατο μόνο επειδή είναι αναπόφευκτοι. Μοιάζουν και επειδή είναι δυσάρεστοι. Υπό την έννοια αυτή, όλοι χειροκροτήσαμε την πρόταση του κ. Αντώνη Σαμαρά στο αποκαλούμενο «Ζάππειο ΙΙ» για χαμηλότερους φορολογικούς συντελεστές. Ειδικώς στην Ελλάδα η χαμηλή φορολογία είναι το άγιο δισκοπότηρο της οικονομίας. Αριστεροί, δεξιοί, φιλελεύθεροι και σοσιαλιστές, όλοι είμαστε κατά των φόρων και υπέρ της ανάπτυξης. Αυτό όμως αποτελεί ταυτοχρόνως και πρόβλημα. Κατά των φόρων δεν είναι μόνο οι Ελληνες· είναι και οι Γερμανοί και οι Ολλανδοί και όσοι τέλος πάντων πληρώνουν (από τους... φόρους τους) μερικά δισεκατομμύρια για να ορθοποδήσει η Ελλάδα. Οπότε είναι σίγουρο ότι με χαρά η κ. Μέρκελ θα πάει στο Κοινοβούλιο της χώρας της και θα πει: «Ξέρετε η Ελλάδα έχει ακόμη κάποιες δυσκολίες και πρέπει να δώσουμε 60 δισ. ευρώ επιπλέον. Α, και να μην ξεχάσω! Θέλουν να πληρώνουν και λιγότερους φόρους...». Να σημειώσουμε ότι οι γερμανικές επιχειρήσεις πληρώνουν περίπου 30% φόρο επί των αδιανέμητων κερδών, όταν οι ελληνικές πληρώνουν 20%. Περισσότερο, δε, και από την κ. Μέρκελ, θα χαρούν οι Ολλανδοί φορολογούμενοι, οι οποίοι έχουν ανώτατο συντελεστή εισοδήματος 52%, όταν στην Ελλάδα είναι 45%. Όσοι ανησύχησαν για την προειδοποίηση της Ελληνίδας επιτρόπου κ. Μαρίας Δαμανάκη, ότι δηλαδή σε κύκλους της Ευρώπης συζητείται στα σοβαρά η επάνοδος, με κάποιον τρόπο, της Ελλάδος στη δραχμή, έπρεπε να ακούσουν τον Δρα Χανς Μπεγκ στο 2ο Χρηματοοικονομικό Φόρουμ της Θράκης, που έγινε το περασμένο Σαββατοκύριακο στην Αλεξανδρούπολη. Ο γνωστός Γερμανός νομικός, ειδικευμένος σε φορολογικά θέματα, δεν είπε απλώς ότι θα είναι καλύτερο για την Ελλάδα να γυρίσει στο παλιό εθνικό της νόμισμα. Πιστεύει ότι η Ελλάδα περνάει μια περίοδο αντίστοιχη αυτήν της Δημοκρατίας της Βαϊμάρης. Γι’ αυτό πρότεινε και μια δραχμή αντίστοιχη του νομίσματος που είχε η Γερμανία στον Μεσοπόλεμο, τη «ρέντεν-ντράχμα». (Το «ρέντεν-μαρκ» ήταν το νόμισμα που έκοψε η Γερμανία το 1923, για να σταματήσει τον υπερπληθωρισμό, και στηρίχθηκε με την υποθήκευση της ακίνητης περιουσίας του γερμανικού κράτους). Τουλάχιστον ο Δρ Μέγιερ Κόρντινγ, γενικός διευθυντής του τμήματος Eurobonds της «Ντόιτσε Μπανγκ», που επίσης μίλησε στο ίδιο συνέδριο, μάς άφησε τουλάχιστον ένα περιθώριο. Δήλωσε ότι ορθώς μπήκε η Ελλάδα στο ευρώ, αλλά η επιστροφή στη δραχμή είναι ένα από τα ενδεχόμενα που μπορεί να αντιμετωπίσει η Ελλάδα έπειτα από δύο χρόνια, αν τα ελλείμματά της εξακολουθήσουν να παραμένουν υψηλά. Ο γενικός διευθυντής του γερμανοελληνικού επιμελητηρίου, κ. Μάρτιν Κναπ, είπε ότι η εικόνα της Ελλάδος έχει τρωθεί και θα χρειαστεί καιρός για να έχει πρόσβαση σε πραγματικούς δανειστές και όχι σε κερδοσκόπους. Η Ελλάδα, είπε, σώζεται σήμερα επειδή οι χώρες της Ευρώπης φοβούνται πως το κόστος της κατάρρευσης του ευρώ υπερβαίνει το κόστος της στήριξης των αδύναμων οικονομιών της. Αυτό όμως μπορεί να αλλάξει: «Αν τα “έξοδα λειτουργίας” του ευρώ ξεπεράσουν το όφελος που έχει ο βιομηχανικός Βορράς από αυτό, θα αποφασίσει να το θυσιάσει». Χρειαζόμαστε, επειγόντως, προοπτική. Κανένας άνθρωπος, καμία επιχείρηση, κανένα κράτος δεν αντέχουν, για τόσο πολύν καιρό, την ίδια προσπάθεια. Χρειαζόμαστε, κάποια στιγμή, όσο κι αν είναι στο βάθος, ακόμη κι αν τραβήξει σε ασυνήθιστο μακρό χρονικό ορίζοντα, μια προοπτική. Δεν πρόκειται απλώς για τη διαβεβαίωση ότι η κρίση, τελικά, θα ξεπεραστεί. Οι πολίτες θέλουν να γνωρίζουν με ποιους όρους, ώστε να μπορέσουν να φανταστούν τη δική τους θέση στη νέα διάταξη των πραγμάτων. Η προοπτική συνοδεύει την αίσθηση ασφάλειας. Οσο πιο μακριά μπορεί, κανείς, να κοιτάξει, τόσο περισσότερο ασφαλής θα αισθάνεται. Μάλιστα, ο συνδυασμός αυτός τροφοδοτεί αποτελεσματικά τις πλέον δημιουργικές δυνάμεις που διαθέτει μια κοινωνία και, εν προκειμένω, μια οικονομία. Αν αρχίσουν να δουλεύουν, αν ξεκινήσουν οι επενδύσεις, τότε, τα πράγματα θα πάνε καλύτερα επειδή, πολύ απλά, θα έχουμε πιστέψει ότι αυτό μπορεί να συμβεί. Η επεξεργασία ενός προγράμματος βοηθά καταλυτικά στα προηγούμενα. Και, για να είμαι ακριβής, δεν χρειαζόμαστε ένα μόνον πρόγραμμα. Αλλά δύο ή και περισσότερα. Το βασικό, προφανώς είναι αυτό που θα μας επαναφέρει στο κανονικό. Μια ανοιχτή οικονομία της αγοράς, όπως είναι και η Ελλάδα, από τις αρχές, σχεδόν, της δεκαετίας του ’90, όπως αυτή που διαθέτουν οι υπόλοιπες χώρες της Ευρωζώνης, πρέπει να συναλλάσσεται με τις αγορές. Οχι με τα κράτη, τις κυβερνήσεις τους και τις αλλαγές στις διαθέσεις του εκλογικού σώματος. If Greece doesn't get another rescue package, it will be in default by mid-July. With two-year Greek bonds fetching yields of 26%, markets are telling the Greeks that bankruptcy is precisely what they expect, never mind whether the euphemism to be used is "restructuring" or "reprofiling." Like previous rescues, the next one—and the one after that—will merely postpone Judgment Day. Ultimately there are three possible outcomes to Greece's current predicament: 1) Europe bleeds forever, treating Greece as a permanent welfare case; 2) The EU swallows Greece's default, or "reprofiles" the Greek debt—the international equivalent of Chapter 11 bankruptcy; 3) Greece abandons the euro. Which is the least-bad option? Forget the dole. Aching under their own spending cuts, Europe's richer nations won't keep paying for Greece sine die. "Why should we scrounge, while others squander?" is the sentiment driving voters into the arms of populist parties from France to Finland. Even if keeping Greece on the bailout drip were economically feasible, it has become a political impossibility. As European leaders wrangle over Greece's debt crisis, investors are scrambling to assess the damage any imminent restructuring would have on the rest of the region. Investors have long expected Greece to default on its debts, but most were anticipating it would happen sometime next year. Now, skirmishes among European leaders last week have raised the prospect that a default could come as early as mid-July—not enough time for Europe's other debt-ridden economies to right themselves. That scenario would make contagion more likely and dangerous, sending bond yields in affected countries soaring and hurting investors. Can Euro-Zone Chiefs Repeat Trick With Vienna Initiative? Euro-zone policy makers are playing for time, desperately searching for ways to keep those members that have been bailed out in funds, but with no clear strategy for ever getting them off life support. 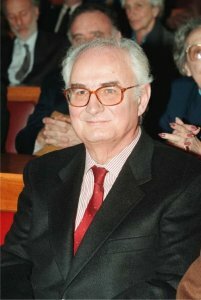 One approach that seems to be gaining traction is a version of what is known as the Vienna Initiative, or, more formally, the European Bank Coordination Initiative.That was a successful attempt to stop a flight of capital from a number of vulnerable Eastern European nations in the months following the collapse of Lehman Brothers. But it is unlikely to be as effective in maintaining funding to the governments of Greece, Ireland and Portugal, and even if it were partially to succeed, it wouldn't in any way address the fundamental problem facing those nations, which is that their economies will grow too slowly to allow them to repay their enormous debt burdens. Ένας παχουλός πενηντάρης, με πυκνά μουστάκια και γεμάτος οργή δήλωσε σε μια ξένη τηλεόραση ότι «δεν χρωστάμε σε κανένα». Αυτόν είδαν και αυτόν άκουσαν στο εξωτερικό όσοι παρακολούθησαν τις σύντομες τηλεοπτικές ανταποκρίσεις για τις «ισπανικού ρυθμού» διαδηλώσεις στο Σύνταγμα. Είναι αμφίβολο ότι αντέδρασαν αποφασίζοντας να δώσουν νέαδάνεια στη χώρα μας ή να αποδεχτούν την παράταση των σημερινών. Δεν ήταν πολύ διαφορετική η αντίδραση πολλών απλών ανθρώπων στη χώρα μας που έτρεξαν στις τράπεζες για να σώσουν τις μικροκαταθέσεις τους σε ευρώ. Διάβασαν διάφορα, κυρίως στο διαδίκτυο, άκουσαν ραδιόφωνα και τηλεοράσεις και σκέφτηκαν υποχρεώσεις και παιδιά. Όχι βέβαια λόγω των «ισπανών». Αλλά γιατί ειδήσεις και φήμες δημουργούσαν την εντύπωση ότι δεν πρόκειται να εγκριθεί η πέμπτη δόση του δανείου και ότι - όπως πολύ σωστά το υπενθύμισε από τις Βρυξέλλες η Μαρία Δαμανάκη - ορισμένοι εταίροι που έχουν βαρεθεί τα συστηματικά «θα» για μεταρρυθμίσεις και θεσμικά μέτρα πολύ θα ήθελαν να τους απαλλάξουμε από την παρουσία μας. Η αλήθεια είναι ότι αν το θελήσουν και συμφωνήσουν όλοι οι εταίροι για κάτι τέτοιο μπορούν (αλλά τους συμφέρουν οι συνέπειες που δεν θα είναι τραγικές ΜΟΝΟ για μας;) να παγώσουν την πέμπτη δόση και κάθε κουβέντα αλλά δεν μπορούν να μας πετάξουν έξω από την ΟΝΕ αν δεν το θέλουμε και εμείς. Μπορούν όμως να μας κάνουν τον βίο αβίωτο. Το θέλουμε; Δεν το θέλει η ηγετική ομάδα της κυβέρνησης, αλλά το θέλουν με απίστευτη ελαφρότητα πολλοί άλλοι. Tuesday 08.05 BST: Reports that the European Union is drafting a second bail-out package for Greece amid possible concessions from Germany revived peripheral sovereign bond markets and the euro, sending the single currency to its highest level in three weeks. The development follows a warning by the International Monetary Fund last week that it could withhold its next tranche of aid amid opposition to further privatisations and asset sales in Greece. The euro briefly topped $1.44 to the dollar before setlling at $1.4385, climbing above its 55-day moving average of $1.4334. Meanwhile, yields on 10 year Greek sovereign debt fell 16 basis points to 15.73 per cent as 10-year German bund yields climbed back above 3 per cent, up 3bp at 3.01 per cent. Europe’s financial problems aren’t confined to Greece and a reorganization of the continent’s banking system is necessary, Laurence D. Fink, chief executive officer of BlackRock Inc. (BLK), said in a Bloomberg television interview today. Inspectors from the EU, International Monetary Fund and European Central Bank are set to wrap up a review of Greece’s progress in meeting the terms of last year’s 110 billion-euro ($157 billion) bailout in coming days. The EU will then formulate its plan for further aid to Greece, which remains shut out of financial markets a year after the rescue package. Many smaller banks in Europe will need to be recapitalized, said Fink. The largest banks on the continent are well capitalized, though devaluation of some of the sovereign credit will put stress on them, he added. Europe is going to need a “giant TARP,” Fink said, referring to the Troubled Asset Relief Program that the U.S. introduced to rescue financial firms. BlackRock advised the Federal Reserve on illiquid debt portfolios during the height of the financial crisis. BlackRock Inc. Chief Executive Officer Laurence D. Fink talks about Europe's debt problems, the process of selecting a new head of the International Monetary Fund, and the health of the global and U.S. economies. Fink said Europe’s financial problems aren’t confined to Greece and a reorganization of the continent’s banking system is necessary. He speaks in Hong Kong with Rishaad Salamat on Bloomberg Television's "On the Move Asia." Luxembourg’s Jean-Claude Juncker, who leads the group of euro-area finance ministers, said a “definitive answer” to Greece’s debt crisis should be reached by the end of next month. “We will try to solve the Greek problem by the end of June,” Juncker told reporters in Paris today. The assessment by a team of officials from the European Union, the International Monetary Fund and the European Central Bank “will partly determine our position” on Greece, he said. Germany is considering dropping its push for an early rescheduling of Greek bonds in order to facilitate a new package of aid loans for Greece, according to people familiar with the matter. Berlin's concession that it must lend Greece more money, even without burden-sharing by bondholders in the short term, would help Europe overcome its impasse over Greece's funding needs before the indebted country runs out of cash in mid-July. But some officials in Berlin hope that a short-term fix can be found that would allow a full deal including a bond rescheduling later this year. Euro-zone officials have acknowledged for weeks that Greece will face a shortfall in financing of around €30 billion ($43 billion) a year in 2012 and 2013—even after a €110 billion bailout agreed last year. But agreement on how those gaps should be filled is proving difficult, thanks to growing political opposition in northern Europe to bailouts of profligate countries such as Greece. Germany has for weeks argued that private investors in Greek bonds should, in some way, bear part of the burden of any new bailout package for Athens. But the European Central Bank staunchly opposes any form of debt restructuring. Meanwhile the International Monetary Fund is demanding clarity on Greece's 2012 funding before it releases money that Greece needs to get through this summer. Καθώς προωθείται το νέο Μνημόνιο, που θα προβλέπει περισσότερο επώδυνα μέτρα από αυτά που συμφωνήθηκαν ένα χρόνο πριν, η συζήτηση γύρω από την υποτιθέμενη εκχώρηση της εθνικής μας κυριαρχίας στους δημόσιους διεθνείς δανειστές μας φουντώνει. Είναι πράγματι έτσι; Ισχύει για την περίπτωση της χώρας μας κάτι τέτοιο; Ο Αν. Καθηγητής Διεθνούς Οικονομικού Δικαίου στη Νομική Σχολή Θεσσαλονίκης Παναγιώτης Γκλαβίνης έχει διαφορετική άποψη. Θα βρείτε το video εδώ. The euro weakened for the first time in three days versus the dollar, while oil and copper fell in New York on concern European governments will struggle to resolve the region’s debt crisis amid a slowing global recovery. The euro declined against 13 of 16 major peers at 4 p.m. in New York. The yield gap between Portuguese and German 10-year bonds climbed to a record and Italian yields rose as the government sold debt. Crude oil lost 0.2 percent, copper futures broke a four-day winning streak and wheat sank 4.9 percent in Paris. The Stoxx Europe 600 Index lost 0.1 percent as EON AG and RWE AG (RWE) dropped after German Chancellor Angela Merkel’s coalition endorsed a plan to close all atomic-power plants by 2022. Greek Prime Minister George Papandreou said he’ll press ahead with new austerity measures after failing to win backing from the main opposition parties as he races to keep bailout funds flowing and avoid default. U.S. employers probably hired fewer workers in May and factory orders in the world’s largest economy grew at the slowest pace in seven months, economists said before reports this week. Greece “will be the focus this week, whether they can agree on the austerity conditions that are required,” Tim Condon, head of Asia research at ING Groep NV, said in a Bloomberg Television interview from Hong Kong. 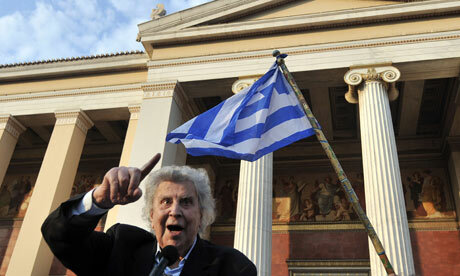 Doubts about the global economy will first “hit the peripheral European debt crisis countries,” he said. Equities, commodity prices and the euro edged lower in quiet, holiday-subdued trading as fears about a Greek sovereign debt default kept investors’ nerves on edge. Rumours over the weekend that Greece had failed to meet any of the fiscal targets set at the time of its first bail-out were followed up with reports that European Union leaders were considering imposing harsh conditions on Athens in order for it to secure further assistance. These were said to include international involvement in tax collection and the privatisation of state assets. “The new conditions – if they are implemented – would be far more practical in nature than the mere ‘targets’ that were agreed during the negotiations for the first bail-out,” said Kathleen Brooks, research director at Forex.com. The currency slid versus most of its major counterparts after Greece’s Prime Minister George Papandreou said last week in Athens that he will press ahead with additional austerity measures after failing to win backing from opposition parties. New Zealand’s dollar dropped after surging today to its highest level since exchange-rate controls ended in 1985 as the nation’s trade surplus widened to a record in April. “Until we get resolution, some clarity on what’s going on, the market is not going to have the confidence to take the euro higher,” said David Watt, senior currency strategist at Royal Bank of Canada’s RBC Capital Markets unit in Toronto. The euro depreciated 0.3 percent to $1.4274 at 3:24 p.m. in New York, from $1.4319 on May 27. The shared currency traded at 115.54 yen, compared with 115.67. The dollar was at 80.94 yen, compared with 80.80, after touching 80.70 on May 27, the lowest level since May 16. The pound fell 0.3 percent to $1.6468. Markets are closed today in the U.S. for the Memorial Day holiday and in the U.K. for the Spring Bank Holiday. The euro declined after Greece’s Antonis Samaras, leader of the biggest opposition party, New Democracy, rejected last week Papandreou’s plan for austerity measures, saying his party wouldn’t be blackmailed. The banner flapped in the wind for almost a week surviving the rigours of sun and sudden downpour. But as thousands of Greeks last night flooded into Constitution Square, Athens' main meeting point, protest ground and central piazza, the fading slogan summed up the mood of the nation at the centre of Europe's debt crisis. "We want our life, we want our happiness, we want our dignity," it declared. "So out with the thieves and out with the IMF." A year after it was forced to accept the biggest bailout in western history a new and fearless spirit is stalking Greece, clogging its city centres, bringing traffic to a standstill and putting authorities on alert. In Athens, the spirit takes hold just before the sun has set. 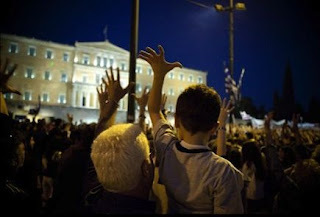 It is then that Greeks, young and old, married and single, employed and unemployed flood the square in a wave of protest against the austerity and recession that has brought their country to the brink of despondency and despair. The European Union is racing to draft a second bailout package for Greece to release vital loans next month and avert the risk of the euro zone country defaulting, EU officials said on Monday. "I am quite optimistic," the chairman of euro zone finance ministers, Jean-Claude Juncker, said after discussing further aid for Athens with French President Nicolas Sarkozy in Paris. A total restructuring of Greece's massive debt was not an option, he said, leaving the door open to some tweaking of Greece's debt profile that might involve the private sector, as Sarkozy advocated last week. Greece could get another euro20 billion ($28 billion) in aid from its fellow euro countries and raise three times that through new austerity measures such as selling government property, a top European Central Bank official says. 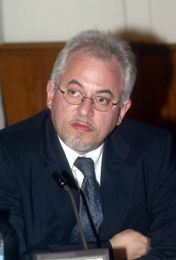 Lorenzo Bini Smaghi, a member of the ECB's executive board, is quoted by the Financial Times as saying Greece needs between euro60 billion and euro70 billion through next year. That gap could be filled in several ways, Bini Smaghi said, giving a rough sketch of a plan for additional assistance that was split between government and private-sector contributions. The private sector money would come partly from selling government property as well as rolled-over investments from Greek banks and issuance of short-term government debt. Greece's conservative opposition demanded tax cuts on Monday as the price for a consensus deal with the Socialist government on imposing yet more austerity, a major condition for getting further aid from the EU and IMF. Conservative leader Antonis Samaras called for a flat 15 percent corporate tax and rejected government plans for hiking taxes to tackle Greece's budget deficit and please fiscal inspectors mulling the next, key tranche of a 110 billion euro bailout. "You want to raise taxes and reach consensus with us, who have set reducing taxes as a priority? Don't even think about it," Samaras said in remarks addressed to the government. "Lower tax rates are the key to starting the engine of the Greek economy," he told members of parliament from his New Democracy party. "If you raise taxes, there will be no room for consensus or for renegotiation." Η Ευρωπαϊκή Ενωση μελετά εσπευσμένως την εκταμίευση προς την Ελλάδα ενός νέου πακέτου δανειακής βοήθειας ύψους 65 δισ. 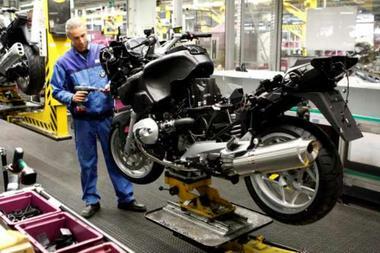 ευρώ για το 2012 και το 2013, αναφέρει σε τηλεγράφημά του το πρακτορείο Reuters επικαλούμενο δηλώσεις Ευρωπαίων αξιωματούχων. Σύμφωνα με τις πηγές αυτές, το νέο πακέτο περιλαμβάνει νέα δάνεια από την Ευρωπαϊκή Ενωση και το ΔΝΤ με αντάλλαγμα την υιοθέτηση από την ελληνική κυβέρνηση πρόσθετων μέτρων αύξησης των δημοσίων εσόδων και την αποδοχή μιας άνευ προηγουμένου εξωτερική εποπτεία για την τήρηση του ελληνικού προγράμματος ιδιωτικοποιήσεων. «Το πρόγραμμα θα προβλέπει νέα δάνεια και επιπλέον τεχνική βοήθεια από την ΕΕ, που θα φθάνει μέχρι την εμπλοκή της ΕΕ στην πορεία του προγράμματος ιδιωτικοποιήσεων», δήλωσε στο πρακτορείο ανώτερος αξιωματούχος της ΕΕ υπό τον όρο ότι δεν θα αποκαλυφθεί η ταυτότητά του. Η ευρωζώνη αναζητεί όλο και πιο απελπισμένα τρόπο να αποτρέψει τη χρεοκοπία και την αναδιάταξη του χρέους της Ελλάδας. «Η κατάσταση είναι σοβαρή», παραδέχτηκε ο Επίτροπος Όλι Ρεν στο Spiegel. Οι προσπάθειες επικεντρώνονται τώρα σε ένα νέο πολυετές πρόγραμμα βοήθειας, για το οποίο οι Έλληνες θα πρέπει να κάνουν πολλές παραχωρήσεις. Ωστόσο η ελληνική κυβέρνηση δεν κατόρθωσε να διασφαλίσει τη συναίνεση της αντιπολίτευσης γι’ αυτό το πρόγραμμα, όπως απαίτησαν η ΕΕ και το ΔΝΤ. Τις επόμενες τρεις εβδομάδες θα πρέπει να βρεθεί μια λύση, για να μπορέσουν στη συνέχεια να αποφασίσουν οι ευρωπαίοι υπουργοί Οικονομικών και η σύνοδος κορυφής της ΕΕ, πριν καταβληθεί η επόμενη δόση του δανείου. Το βέβαιο πάντως είναι ότι η Ελλάδα πρέπει να λάβει οπωσδήποτε την επόμενη δόση, γιατί διαφορετικά κινδυνεύει να κηρύξει μη ελεγχόμενη πτώχευση. Μετά τη δήλωση Ρομπάι ότι θα πρέπει να γίνουν τα πάντα, προκειμένου να αποτραπεί αδυναμία πληρωμών, και από την Καγκελαρία στο Βερολίνο ακούγεται τώρα ότι δεν θα επιτρέψουν να καταρρεύσει η χώρα. 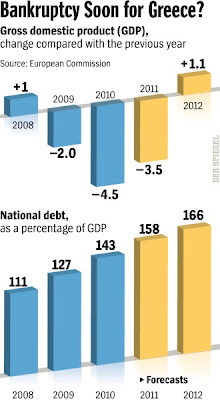 How should Greece try to reduce its debt? Some say Greece should privatise some of its ports and tourist hotspots. While on paper such a move might significantly reduce the debt, this column argues that these calculations rely on some shaky assumptions. Such a sale could make Greece worse off overall. George Papaconstantinou, Greece's minister of finance, announced on Monday a plan to create a sovereign wealth fund, a sort of Greek “Treuhandanstalt”1 that would implement the ambitious privatisation programme agreed with the EU and the IMF. The plan should raise approximately €50 billion by 2015. The remaining €35 billion should come from airports, ports, the sale of the government share of the OTE telephone company (30%), the privatisation of public utilities, tourism, and a restructuring of the state-owned Greek Agricultural Bank (Hope 2011). This is an ambitious agenda that would reduce Greece's outstanding debt €300 billion by approximately 17%. Many in Europe assume that Greece will ultimately have to default on a portion of its debt. In an interview with SPIEGEL, European Monetary Affairs Commissioner Olli Rehn, however, insists that debt restructuring is not on the agenda. He also discusses reports that Athens is considering a return to the drachma. SPIEGEL: Mr. Rehn, your Greek colleague on the European Commission, Maria Damanaki, said last week that either Athens and its lenders agree to tough sacrifices, "or we return to the drachma." Did she merely say what everyone is thinking? Rehn: The public misunderstood my colleague's statement. She was trying to encourage her countrymen to implement the austerity program so that Greece can remain a member of the euro zone. SPIEGEL: So you are no longer ruling out a return to the drachma? Rehn: I do not see a withdrawal from the monetary union as a serious option. 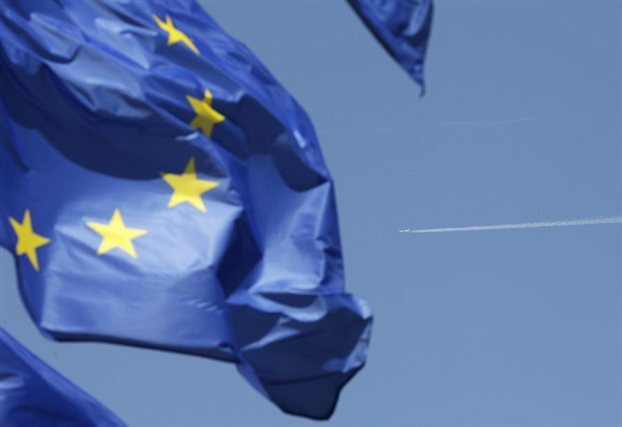 It would harm the Greek economy and be a setback for European integration. The euro is more than a currency; it's the central political project of our community. For this reason, too, we would not accept a Greek withdrawal. 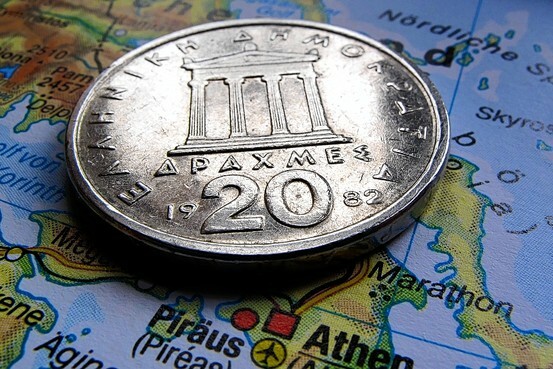 SPIEGEL: But the Greeks themselves have played out the scenario of reintroducing the drachma. Rehn: All I can say is this: I am not aware of it. We in the Commission and in the euro group are not working with such a scenario. 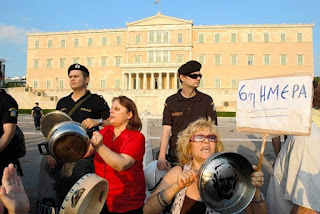 SPIEGEL: Then let's put it this way: What do the Greeks have to do to avoid a withdrawal from the euro zone? Rehn: We expect Athens to do its homework, which includes reducing its deficit and privatizing government assets worth €50 billion ($71 billion). Greek government bonds were under pressure again Monday, with two-year Greek yield spreads over German paper widening as speculation on solutions to Greece's debt crisis intensified. The latest bout of pressure on Greek debt comes after reports emerged over the weekend that a plan to increase external intervention on Greek tax collection and privatization is gaining ground. Separately, Swedish Finance Minister Anders Borg told Germany's Die Welt that there can be no talk of extending Greek debt maturity until the country achieves a budget surplus. Greek two-year spreads over corresponding German treasury notes, or schatz, were up 0.114 basis points at 23.168 percentage points by late morning in Europe. Further down the curve, Italian and Spanish yield spreads have widened more than Greek yield spreads as Italy and Spain are set to sell government bonds Monday and Thursday, respectively. A team of European and International Monetary Fund officials is scheduled to conclude a closely watched examination of Greek government finances this week as bellwether bond auctions are expected to provide a sign of whether anxiety over Greece's debts is infecting investor appetite for sovereign bonds elsewhere in the euro zone. Italy will seek to raise as much as €8.5 billion ($12.1 billion) from bond investors Monday, while Spain is seeking an estimated €3.5 billion as officials from the so-called troika of the IMF, the European Central Bank and the European Commission finalize their deliberations. he troika is examining how to fill a shortfall in Greece's finances next year after it became clear that the country wouldn't be able to return to bond markets next year, as originally planned under the €110 billion Greek bailout of a year ago, and after it failed to hit budget cutting targets. Lorenzo Bini Smaghi, European Central Bank executive board member, used an interview in today’s Financial Times to explain in detail just why the ECB is so opposed to any kind of Greek debt restructuring. In doing so, he took on directly those such as Nouriel Roubini and Deutsche Bank’s Thomas Mayer, who have called for an “orderly” restructuring, drawing on lessons learnt from the Latin American experience in the 1980s. His messages, based on extensive scenario analysis by ECB economists, were that an “orderly” restructuring was a “fairytale,” there was no such thing as a “soft” restructuring, and the consequences of default would be catastrophic. What's best for Greece and Europe -- a soft debt restructuring or billions of euros in loans for years to come? Berlin and the ECB are deeply divided over the best way to handle the crisis. A number of influential Germans fear the threat of austerity measures could be greater than a "haircut" of Greek debt. It wasn't all that long ago that Europe's top monetary policy experts and the leader of the European Union's most important member state were politely exchanging compliments. Jean-Claude Trichet, president of the European Central Bank (ECB), praised German Chancellor Angela Merkel for having made Germany into an "example for all of its neighbors." Merkel, for her part, thanked the Frenchman for his decidedly "successful actions." A few years and a crisis later, the relationship has cooled off considerably. Merkel feels that the Frankfurt-based monetary watchdogs are pressuring her inappropriately, while Trichet and his fellow bankers have taken to characterizing the Berlin government's proposals as "incorrect," "illusory" or simply as a "catastrophe." Today, members of the German government and the ECB seem to have trouble spending time in the same room together. 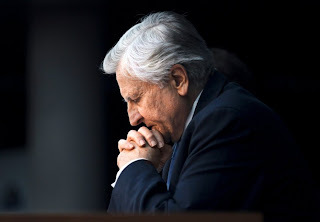 At a recent meeting of finance ministers in Luxembourg, Trichet stormed out of the room after being confronted with yet another crisis plan from Germany that he didn't like. The controversy revolves around the future of the common currency, which instruments ought to be used to rescue the euro and, not least, a workable plan to support ailing Greece. While Merkel has long advocated a cautious restructuring of Greece's debt, Frankfurt-based Frenchman Trichet categorically rejects any form of debt deferral for Athens. Στην φωτογραφία της Μαρίας Μαράκη φαίνεται καθαρά αν και διακριτικά. Ένας άντρας κρατάει στην αγκαλιά του ένα παιδί και του δείχνει πώς να μουντζώνει τη Βουλή. Και ο μπόμπιρας, τι να κάνει, μουντζώνει ο πατέρας του, μουντζώνει και αυτός. Ανάλογες εικόνες είδαμε μετά την πρώτη συγκέντρωση των «αγανακτισμένων». Μικρά παιδιά στους ώμους των πατεράδων τους να προσπαθούν να φωνάξουν ρυθμικά «κλέφτες - κλέφτες» χειρονομώντας ταυτόχρονα προς το μέρος των τεράτων (δηλαδή της Βουλής). Και οι γονείς τους, να χαμογελούν γεμάτοι υπερηφάνεια στον τηλεοπτικό φακό της μεσημεριανής εκπομπής, με τον ρεπόρτερ να μην μπορεί να κρύψει –και αυτός - τη χαρά του. Από τους χιλιάδες «αγανακτισμένους» βρήκε τους πέντε - δέκα γελοίους που συμπεριφέρονταν σαν παίκτες ρεάλιτι. Το ίδιο θέαμα το έχω δει και στα γήπεδα. Παιδιά του δημοτικού, όρθια πάνω στα καθίσματα να επιτίθενται στους «αντιπάλους» τους με λέξεις και χειρονομίες που δεν καταλαβαίνουν αλλά που γεμίζουν ικανοποίηση τους γονείς τους που χασκογελούν στα πίσω καθίσματα. Και τότε και τώρα αναρωτιέμαι τι γονείς είναι αυτοί. Για ταξιτζήδες δεν μου μοιάζουνε. Γιατί θα ήταν μια δικαιολογία. Τόσα χρόνια στο τιμόνι, το χέρι τους έχει πάρει τη μορφή μούντζας, ε μεταδίδουν την γνώση στο παιδί τους. Ταξιτζήδες όμως δεν είναι (αφήστε που οι ταξιτζήδες μετά από τέτοιο κράξιμο την έχουν κόψει νομίζω τη συνήθεια). Ποιοι είναι λοιπόν αυτοί οι γονείς; Ποιοι κατεβάζουν στο Σύνταγμα και στα γήπεδα τα παιδιά τους, πέντε, έξη, εφτά χρονών και τα βάζουν να βρίζουν και να χειρονομούν; Όσο τους προσέχω τόσο μου μοιάζουν με τις φάτσες των … τεράτων που πολεμούν. Απογοητευμένα λαμόγια δηλαδή που δεν αντέχουν το «ρίξιμο» και αντιδρούν σαν προδομένες γκόμενες. Βρίζουν, φτύνουν, χειρονομούν. Καθώς η δημοσιονομική κρίση εισέρχεται σε νέα δραματική φάση κάποιοι σκέπτονται ως λύση την επιστροφή στη δραχμή. Το βασικό επιχείρημα είναι ότι η επιστροφή στο εθνικό νόμισμα, σε συνδυασμό με μια «γενναία» υποτίμηση, θα αυξήσει την ανταγωνιστικότητα της Ελληνικής οικονομίας, με συνέπεια την ταχεία έξοδο από την ύφεση, επιστροφή σε ισχυρούς ρυθμούς ανάπτυξης και μείωση τόσο του δημοσιονομικού ελλείμματος όσο και του δημόσιου χρέους. Η παραπάνω άποψη είναι λανθασμένη για τουλάχιστον έξι λόγους. 1. Μια τέτοια εξέλιξη θα είχε απροσδιόριστες συνέπειες για τη ρευστότητα της ήδη δεινοπαθούσας ελληνικής οικονομίας καθώς θα επιτάχυνε την έξοδο των καταθέσεων από τις ελληνικές τράπεζες. Οι έλληνες καταθέτες, λόγω της προκαλούμενης μείωσης της αγοραστικής δύναμης της δραχμής έναντι του ευρώ (και των λοιπών νομισμάτων), θα έσπευδαν να αποσύρουν τις οικονομίες τους από τις ελληνικές τράπεζες αναζητώντας ασφάλεια στο εξωτερικό. 2. Συχνά αναφέρεται ότι πιθανή έξοδος της Ελλάδας από την Ευρωζώνη, με μία ταυτόχρονη υποτίμηση του εθνικού της νομίσματος, θα ωφελούσε τα μέγιστα τις ελληνικές εξαγωγές καθώς η πλειοψηφία αυτών καταλήγει στην Ευρωζώνη. Σε αυτή την περίπτωση όμως, η υποτίμηση θα οδηγούσε σε περαιτέρω έκρηξη του εγχώριου πληθωρισμού και κατά συνέπεια σημαντική απώλεια στα όποια οφέλη της ανταγωνιστικότητας, πόσο μάλλον που ο πληθωρισμός σήμερα όχι μόνον υπερβαίνει τον μέσο όρο της Ευρωζώνης περισσότερο από μια ποσοστιαία μονάδα, αλλά και εξακολουθεί να εμφανίζει βραδεία αποκλιμάκωση σε πείσμα της συνεχιζόμενης ύφεσης. Δεν υπάρχει αμφιβολία ότι η φορολογία στις επιχειρήσεις είναι υψηλή στην Ελλάδα κάτι που ασφαλώς αποτελεί αντικίνητρο για επενδύσεις και κατά συνέπεια για την οικονομική ανάπτυξη. Απ’ αυτή την σκοπιά o Αντώνης Σαμαράς έχει απόλυτο δίκιο να θέτει το θέμα της φορολογίας στο επίκεντρο των μέτρων που προτίθεται να λάβει η κυβέρνηση και να επιμένει στο θέμα της μείωσης των φορολογικών συντελεστών. Όμως αυτό που ίσως λησμονεί ο αρχηγός της Αξιωματικής Αντιπολίτευσης είναι ότι η φορολογία δεν είναι ο μοναδικός παράγων που προσδιορίζει τις επενδύσεις ούτε είναι κατ’ ανάγκη ο πιο σημαντικός για την οικονομική ανάπτυξη μιας χώρας. Το επίπεδο της φορολογίας είναι μια-αναμφίβολα σημαντική-από τις παραμέτρους που προσδιορίζουν αν ο επιχειρηματίας θα επενδύσει, αλλά όχι η μόνη. Άλλωστε οι χώρες με τα υψηλότερα ποσοστά καινοτομίας, επιχειρηματικότητας, ποιότητας ζωής παιδείας κλπ είναι οι Σκανδιναβικές και ο Καναδάς όπου ως γνωστό το επίπεδο της φορολογίας είναι αρκετά υψηλό. How do I save thee? Let me count the ways. As euro-zone policy-maker-in-chief, I can force you to sell off some of your assets. But in the absence of a land registry you don't have clear title to those assets, which might make potential buyers squeamish. 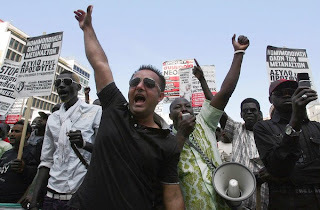 Worse still, your trade unions might be upset, and riot or be unwilling to work efficiently for a private-sector buyer. Besides, you only want to sell minority interests, and who wants to partner with a government that has such novel methods of keeping its books? Anyhow, asset sales cannot be arranged in time to get you the cash you need quickly enough. I might once again pass the collection plate among my friends. But they seem reluctant to contribute again, especially since Greece's opposition New Democracy party has announced it will not support any new spending cuts, and it is clear to the richer countries that this is not the last time I would be asking them to be generous. After all, they are elected politicians, and their taxpayers are not happy picking up the bill for your past profligacy, as German Chancellor Angela Merkel and Finland's politicians have already discovered. It has come to this. A year after rescuing Greece from default, Europe is staring into the abyss. The bailout has proved insufficient. Greece needs more money, and it can’t borrow from private markets, where it faces interest rates as high as 25 percent. But Europe’s governments are reluctant to advance more funds unless other lenders — banks, bondholders — absorb some losses by writing down their debts. This, however, would constitute a default, risking a broader banking crisis that might torpedo Europe’s fragile recovery in France, Germany and elsewhere. There is no easy escape. What’s called a “debt crisis” is increasingly a political and social crisis. Looming over the financial complexities is the broader question of the ability — or willingness — of weak debtor nations to endure growing hardship to service their massive government debts. Already, unemployment is 14.1 percent in Greece, 14.7 percent in Ireland, 11.1 percent in Portugal and 20.7 percent in Spain. What are the limits of austerity? Steep spending cuts and tax increases do curb budget deficits, but they also create deep recessions, lowering tax revenue and offsetting some of the deficit improvement. Να «επαναδιαπραγµατευθούµε» για να επιβάλουµε στους δανειστές µας τους όρους, µε τους οποίους µας βολεύει να µας χρηµατοδοτούν. Αυτά – και άλλα πιο ελαφρά – που ειπώθηκαν στη σύσκεψη των πολιτικών αρχηγών δείχνουν ότι άθελά της η κυβέρνηση προκάλεσε τελικά µια δραµατοποίηση: ανεβάζοντας στην ίδια σκηνή όλους τους παίκτες, έδωσε χαρακτήρα τελετουργικό στο πολιτικό αδιέξοδο της χώρας. Παρέστησε το τέλµα ως ιλαροτραγωδία. 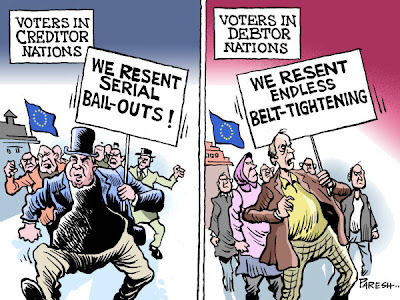 Financial Times: Euro area membership was based on obeying fiscal rules. Surely those who break the rules should pay the price – even if that means defaulting or exiting the euro area? Mr Bini Smaghi: You are correct that those who do not respect the rules should be punished, and this is what happens when countries agree to follow an IMF/EU adjustment programme. They have to adopt measures – fiscal and structural – which reverse their previous mistakes. A debt restructuring, or exiting the euro, would be like the death penalty – which we have abolished in the European Union. On top of that drastic measures such as a default or restructuring would produce contagion effects in other countries and affect taxpayers in the other countries. Why should they pay for the mistakes of others? FT Some argue that a Greek default would be the least worst-option for the euro area. The impact on the euro area would be containable and it would reinforce euro area principles long term. Why are they wrong? LBS It would not be the least worst option - as we can see from the reaction of financial markets, not only within the euro area but also outside. The destabilizing effect could be quite dramatic. Those who say that the impact would be contained simply do not look at the data. It reminds me of those who in mid-September 2008 were saying that the markets had been fully prepared for the failure of Lehman Brothers. All sophisticated indicators of systemic risk, cross correlations of CDS and yield spreads show a high sensitivity to restructuring moves and are at levels higher than in September 2008. Suggesting that there are no contagion risks is naïve and entails taking a risk that no responsible policy maker can afford, if he or she has any interest in the well being of its citizens. In addition, default or restructuring would not help solve the problems of the Greek economy, problems that can be solved only by adopting the kind of structural reforms and fiscal adjustment measures included in the programme. On the contrary it would push Greece into a major economic and social depression. People involved in the talks said the package would also include incentives for private holders of Greek debt voluntarily to extend Athens’ repayment schedule, as well as another round of austerity measures. Officials hope that as much as half of the €60bn-€70bn ($86bn-$100bn) in new financing needed by Athens until the end of 2013 could be accounted for without new loans. Under a plan advocated by some, much of that would be covered by the sale of state assets and the change in repayment terms for private debtholders. Eurozone countries and the International Monetary Fund would then need to lend an additional €30bn-€35bn on top of the €110bn already promised as part of the bail-out programme agreed last year. Officials warned, however, that almost every element of the new package faced significant opposition from at least one of the governments and institutions involved in the current negotiations and a deal could still unravel.